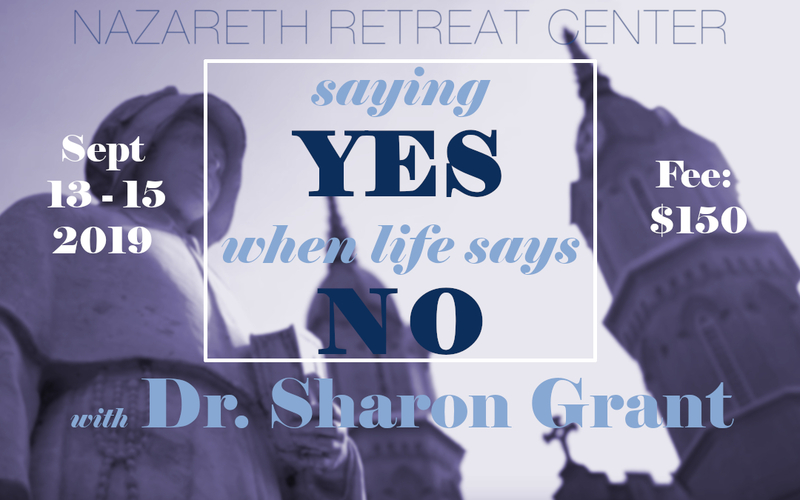 Title: Saying Yes When Life Says No Presenter: Dr. Sharon Grant Date: 13 – 15 September 2019 Fee: $150 (includes programming, meals, and lodging) Dr. Sharon Grant earned an STM in Sacred Theology and a doctorate in Ministry from Regis College in Toronto. Recently, she served as hospital chaplain at a teaching hospital with a focus on ministry to cancer patients and as a coordinator of spiritual care at a community hospital with an emphasis on multi-faith support. Sometimes we go through periods of life when we feel we have lost ourselves, when our life has changed so radically that we no longer know who we are or what we are to do. There could have been the loss of a loved one, an illness or accident that affected our body, a major move, the loss of a dream we had held, the loss of a job or of our ability to continue our work. It could have been a series of losses. Life has said “No” to our wishes, our plans. We may feel powerless, angry, numb, sad or confused. We may have no words to express what is happening to us. The poet Rumi says: “Gone, inner and outer, No moon, no ground, no sky.” What do we do? Where do we go? How can we say “Yes” to life when life says “No” to what we want? These are questions we will explore through shared reflection and dialogue. Registration will continue until 30 August 2019 or until all spots are full. Scroll to the bottom of the page to register.